Highway, Airport and commercial Striping – Action Safety Supply Co. 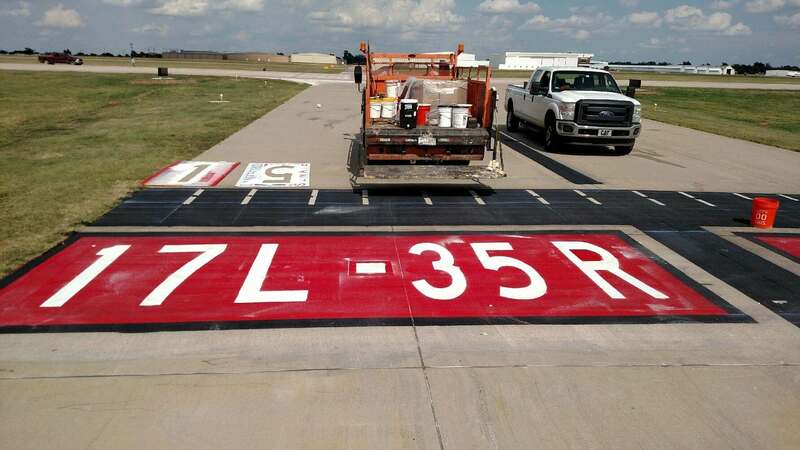 This includes airport striping, taxiway striping, reflective striping, non-reflective striping, highway striping, and roadway markings and more. Action has a first rate striping crew ready to work on your commercial, industrial or private location. Our thermoplastic markings are applied using specially designed vehicles. The thermoplastic mix is heated in trucks to about 200 °C (400 °F) before being fed to the application apparatus. This is often a screed box or ribbon gun. Immediately after the thermoplastic has been applied, glass beads are laid onto the hot material so that they embed before the plastic hardens. These beads provide initial retro-reflection. As the marking wears during use and the initial beads are lost, the beads mixed with the binder are uncovered, providing long term reflectivity. Most thermoplastic is produced in white and yellow colors, but other colors such as red may also be produced. Plastics were introduced in the late 1960’s and early 1970’s. Commonly referred to as tape or cold plastic, this product is heavy-grade material with reflective beads embedded in the plastic. It is commonly used to mark crosswalks, stop bars, and traffic guidance such as turn lanes, HOV lanes, train crossings, pedestrian crossings, taxi lanes, bus lanes, and bike lanes.